This year I went out a little harder than I expected to. This is a tough race for constraining yourself because the course starts downhill and there are a lot of kids that like to go out really fast. But after half a mile there were only two people ahead of me, and a mile after that it was me and one other kid who kept about 3 seconds ahead of me the entire race. I was aiming for a sub-40 minute race so he was pushing me a bit harder than I would have liked, but it was nice having somebody to run with/against. As we approached the last straightaway, he started pulling away from me. 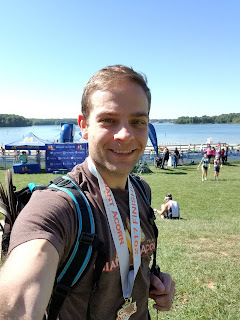 I was happy with my pacing at that point in the race, even if I knew I was going to pay for my shoddy pacing earlier, so I didn't bother picking things up to catch him. But as soon as we got on the final straightaway, a spectator told me to turn on the afterburners and catch him. I had to explain to him that I had another lap to go. The kid in front of me ended up crossing the finish line for the 5k about 8 seconds ahead of me. I called out to him as I continued on to my second lap and congratulated him on a race well run. My second lap was not nearly as good as the first. 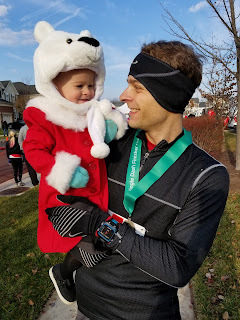 Maybe it's because I didn't have the kid to pace me, maybe it's because I forgot to set the pace alarm on my watch, or maybe I was just paying the price for running too fast early in the race, but I was about a minute slower on the second lap. I just barely missed my goal of sub 40-minutes (though I'll have to wait for the official results to see if the 40:03 on my watch magically transforms into 39:59 due to lazy button pushing). After the race I had a few people come up to me and tell me that I had a great race. I appreciated hearing that and I actually don't recall people coming up to me in years past. In fact, I distinctly remember being told to run a third lap one of these past years. Jenny and Ellie were also there and it was great to see them and have them help distract me from the, admittedly mild, pain of having just run pretty hard for 40 minutes straight. As we walked up to the after party, a middle-aged woman who had clearly not run the race approached me. She said asked if I was the person that won today, and if I had won last year as well, and I admitted that I had. She then said that her son saw me at the start line and told her that he was going to pace by me because he knew that I had won last year. It was pretty humbling to have a kid's mom come up and say that, but in reality, he was pacing me! After the race I saw him and we both congratulated each other. It's just a funny world - you never know who's looking up to you.